I Need A Trade Show Booth. How Much Does Trade Show Booth Cost? Do you see a trade show in your future? No brand is an island. It doesn’t matter if your company manufactures painting supplies, books airline tickets, or distills whiskey: your business is a facet of a larger industry. Regardless of the industry you are a part of, the chances are high some of your peers and contemporaries are hoping to make new connections within their field. Attending a trade show is a natural way to accomplish this. Once you’ve decided to attend an upcoming expo or conference, you’ll have quite a bit of planning cut out for you. In short, it’s time for you to get down to work. But before you book hotel rooms, select equipment, or hire staff, your team has one crucial task: create a realistic trade show budget. 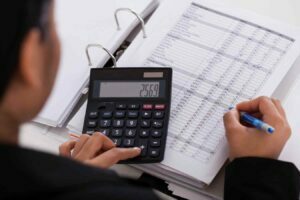 When making your budget, it’s important to consider every little cost required for the trade show. It’s imperative that your marketing and finance teams think sensibly about what is fiscally possible. What are our goals for attending this trade show? From increasing brand awareness and generating leads, to networking with industry peers and scoring wholesale deals, companies attend trade shows for all sorts of reasons— what’s yours? Attending a trade show doesn’t tend to be a local experience. While your company may be based in Wichita, your industry’s next trade show could be in, say, Las Vegas. This means that you need to factor in transport (for both your team and your equipment,) accommodation, and potential coverage back at the office. How much event staff will we need, and who from our team will be attending? Think about who will be representing your brand at the show. Will members of your marketing or sales team be in attendance? If you are hiring new event staff, they will need to be properly trained. How will we display our product? What sort of amenities and special features will we require? In an ideal world, what would you want your trade show booth to look like? Dream big, and then identify what aspects make your vision pop. What elements are needed to show your prospects the best of your brand? You may need: screens and monitors, branded giveaways and freebies, marketing materials, and specialty tech details, all of which need to be realistically considered for the space size and factored into your budget. What would our ideal budget look like? Industry experts have said that an exhibition space should cost about a third of your entire budget. This is quite helpful, as you can simply work backwards from the total budget available. Ask yourself point-blank: what is the absolute most we can afford to spend on this show? If the answer is $45k, then you should be looking into a display booth rental that costs around $15,000. From there, you can begin to factor in everything else you need from a financially sound standpoint. The size of your booth will correlate with your display budget. Generally, the most affordable booths tend to be on the smaller size, while the sprawling 50x50s will be on the much higher end. An allotment of 10-25k will present your team with plenty of options! With a budget in this range, it makes the most sense to hire a 10×10, 10×20, or 20×20 booth. Some brands have even been renting two lower-budget 10x10s to open up their layout and increase their expo presence. A mid-range budget will allow for a myriad of size and dimension choices. A budget in this sphere can provide you with a 10×30, 20×30,20×40, 20×50,30×30, or 30×40 rental booth. A premium trade show budget means that your brand is able to rent and work with a large displays: 30×50,40×40, 40×50, and 50×50. No matter your price point, there are a few things every shrewd marketing exec or business owner should look for when renting a trade show display booth. 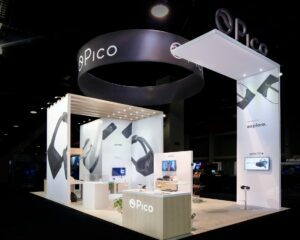 A trade show is your brand’s time to shine, and there’s no better way to show your prospects who you are than with a customized trade show display. Having a display that’s been tricked out in the colors and aesthetic of your branding gives your team greater opportunity to tell the story of your company. It increases brand awareness, draws more prospects to your display, and allows for you to present exactly who you are to your attendees. It’s a common misconception that rentals can’t be customized, which, to be frank, is nonsense. Of course, you can customize a rental display! It’s true, not every idea that your marketing team dreams of might be possible with a rental; customizations that would damage or permanently alter your hired booth is off the table. However, it’s entirely possible to create a unique and well-branded rental booth with the right team. Indeed, any reputable rental company will be able to customize your rental by using specialty graphic production, color schemes, and design details. At Exponents, we offer end-to-end services for trade shows all around the United States. In our 35+ years experience with 18,000 clients across the nation, we’ve managed to get the art of nailing expos down to a science. We’re ready to partner up with your brand and share our expertise with you. We offer a helping hand, every step of the way. From deciding on an appropriate rental to keeping you in the loop via 3D renderings and a dedicated project manager, Exponents will be by your side through the entire trade show process. Making your business shine is what we do best. Get in touch with us today to learn more about how we can help you navigate your upcoming trade show.